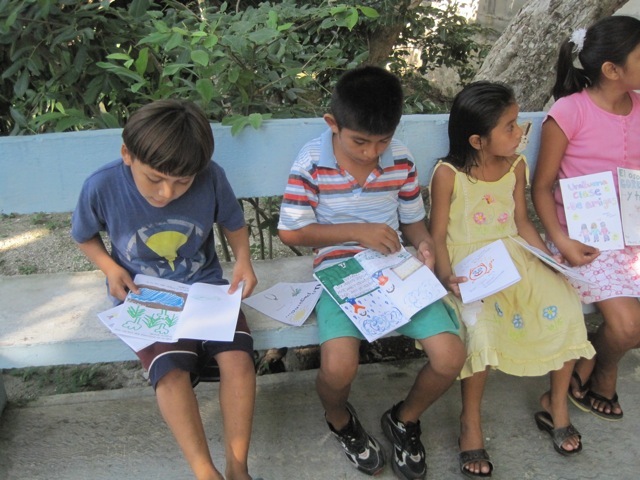 Hekab Be Biblioteca ~ Open Road Community Library: Collaborative Project: Kid-Made Books! 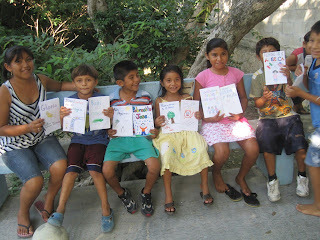 Hekab Be kids show off the books they helped make! 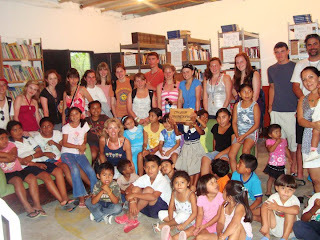 Students from Coginchaug Regional High School in Connecticut, and their Spanish teacher, Nancy Alberico, pose with library staff and kids. ....and so do the Coginchaug students!! Two years ago, by a twist of fate and a little confusion, a wonderful collaborative book making project began between the children of HB and Spanish students from Coginchaug Regional High School in Durham, Connecticut. Someone had dropped off books, made by some students in the U.S. or Canada, that were partially completed. HB’s former director, Leo, thought it would be a great idea to have the kids at HB finish the books and send them back to the students. When Nancy Alberico, the Spanish teacher at Coginchaug H.S., and a regular supporter of HB, came to the library with her students in April of 2009, Leo gave her the books. You can imagine Nancy’s surprise since she wasn’t the one who’d taken the books there originally! But being both a good sport, and creative thinker, Nancy realized what a great idea this project was, so she went home and had students in three of her Spanish classes start making books which were delivered to HB later that same year. Two years later, the project continues, and each time, new students at Coginchaug H.S. and new kids at HB get the chance to participate in making their own books! Kids on both ends love making the books and love seeing the final products!